I really like macaroni and cheese, so much so that I have two books dedicated completely to this dish. 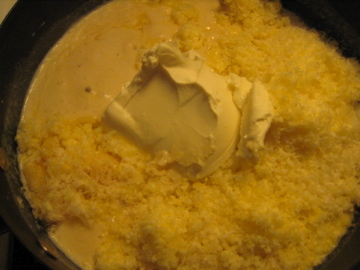 Once you get used to the basic formula – grate cheese, make roux, add milk, add cheese, bake – it’s very easy to explore different variants on the same paradigm. Recently, while reorganizing a cork board stacked with pictures and recipes ripped from La Cucina, Food and Wine, etc., I came across a piece I’d saved from Bon Appetit, circa 2008. 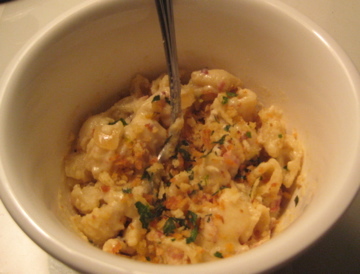 They had profiled Mio Kitchen and Wine Bar in Pittsburgh, PA, and detailed their family meal recipe for Mac and Cheese with Pancetta. It may have taken two years for me to actually put the recipe to use, but it was worth the wait. 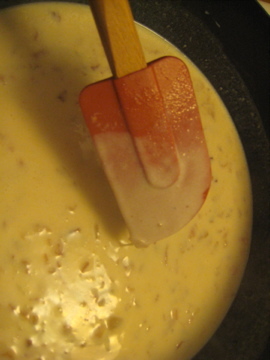 The combination of cheddar, parmesan, and marscapone was not one that I had tried before, and it gave a mellow, nutty flavor to the sauce, though I felt that I had to add more salt than normal. And, when I cook this again I am going to add a squeeze of lemon and replace half of the marscapone with sour cream- I think the acid will perk up the flavors a bit and bring out the smokiness of the pancetta. 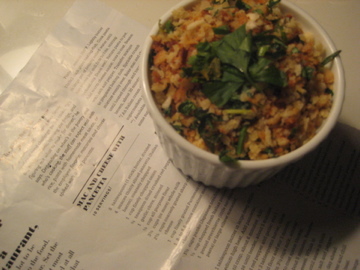 Here is Mio’s recipe with my commentary, if you’d like to give it a try. 1. 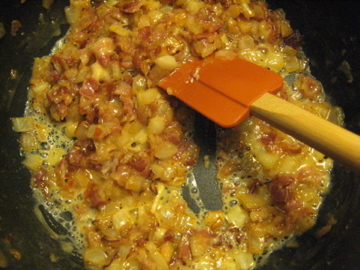 Melt 1 tbsp of butter in a large deep skillet over medium-high heat. 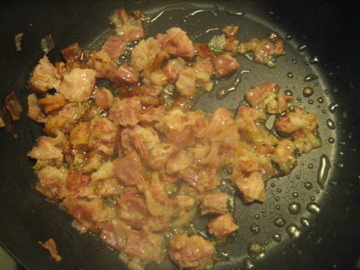 Add pancetta (4 oz coarsely chopped) and saute until crisp (about 6 minutes). 2. Add 1 cup finely chopped onion, saute until tender, then add 3/4 tsp crushed red pepper and 1 minced clove of garlic, stir for one minute. 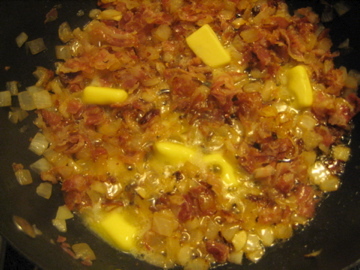 Stir in three tablespoons of butter, allow to melt. 4. Gradually whisk in 3 and 1/2 cups whole milk, simmer until thick enough to coat a spoon, stirring frequently, about 5 minutes. 5. Remove from heat. Whisk in one 8 oz container marscapone, 2 cups grated sharp cheddar, and 1 cup grated parmesan. 6. 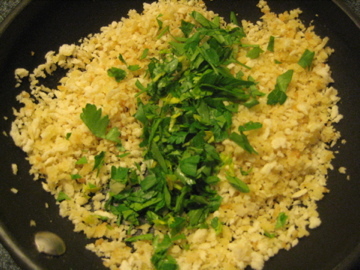 In a separate pan, melt three tbsp butter, then add 1 1/2 cup panko breadcrumbs and a handful of chopped parsley, stir until golden brown. Now, at this point one has to decide how they want to eat their mac and cheese. You could cook a pound of pasta, add the sauce, top it with the breadcrumbs and bake it for 30 minutes at 350. Or, you could cook a small amount of pasta, add cheese, and bake a single portion, which allows you to then save the rest of the sauce in the fridge and have mac and cheese all week. Or, if you are really hungry, this recipe is good enough that you can bypass the baking step altogether. Cook pasta, cover with copious amounts of sauce, put in bowl, top with breadcrumbs. Eat! I love this Mac and Cheese too. This recipe will be harder to find now as Mio fell victim to the economy and closed it’s doors last month. So glad we can still enjoy this dish!